We arrived in Bangkok well past midnight on the 31st of October. Caught a cab to the Davis Bangkok, which is a really lovely hotel, with a beautiful swimming pool, jaccuzzi, sauna, gym and the best Thai hospitality. We were so excited to meet up with Matt & Cath for breakfast the next morning and we never stopped talking for about 5 hours. We had lots to catch up on. In the afternoon, we went to the hotel gym and had a lot of fun working out a routine on the bike, treadmill and weights. Late afternoon we went out to explore the area and stumbled upon a tour agent, so decided to book a tour to the floating markets and rose gardens for the next day. Afterwards, we booked a Thai massage for all four of us, which was not quite as relaxing as expected (in fact, quite stressful at times! ), but still a great experience - I felt quite relaxed when it was over though. It's not your typical massage where you relax and want to fall asleep - you actually have to force yoursefl to relax, because you get quite nervous when they start stretching your arms and legs in all directions. We laughed a lot, as we had to wear the special Thai massage outfits, which looked just like pajamas. This is so that they can stretch and pull your legs and arms without your clothes restricting the movement. We really felt like we were living the high life, as Cath and I also booked a hair cut for the Saturday and then then four of us had dinner at a lovely little restaurant and sampled our very first authentic thai green curry in Thailand. It was very hot, but delicious and beautifully presented. The next morning our tour started at 06:20am and after picking up several other tourists, we headed for the floating markets. 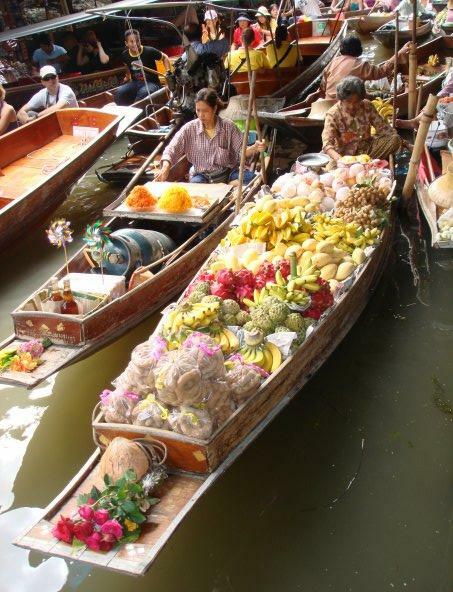 It was beautiful to see the colourful boats, carrying vegetables, flowers and all kinds of thai ingredients. It was amazing to see how they prepared anything from rice to spring rolls right there on their boats. From there we headed to the rose gardens, where we saw a local production about the Thai lifestyle, including some Thai boxing and how wedding ceremonies are conducted. The rose garden itself was a bit of a disappointment,as the flowers were not in bloom. The tour was okay, but we realised that we preferred to do our own thing in our own time, so we decided not to book any more tours, but to rather do things on our own steam. It's hard work, but it gives you more freedom and definitely more value for money. The next day was earmarked for suits, hair and high tea. We really felt as if were living the high life. Spent the morning getting measure up and selecting the material and styles for our tailor-made suits, before going for our hair cuts, followed by high tea at the Oriental hotel. After filling our stomachs to the max, we stopped off at the Bangkok market to browse around the stalls. A terrific day out.